Thanks to Helen, the Patient Gardener for organising this meme, I think it is the one I enjoy reading more than any other because everyone approaches it from a different angle. Unbelievably the weather has remained spring-like all this month. The mornings are chilly, and there is always heavy dew, a good thing as there hasn’t been much rain, a couple of showers and that’s it. Some mornings the dew has looked like frost but no plants show any signs of frost damage. I am still picking strawberries not many but it is lovely to have them at this time of year. This is the first time I’ve ever grown strawberries as in England we lived near a pick-your-own and it never seemed worth the space to grow them. In Italy they are only available in the shops for a relatively short time. I didn’t even expect a great crop this year but I’ve been amazed at the quantity and quality of fruit. 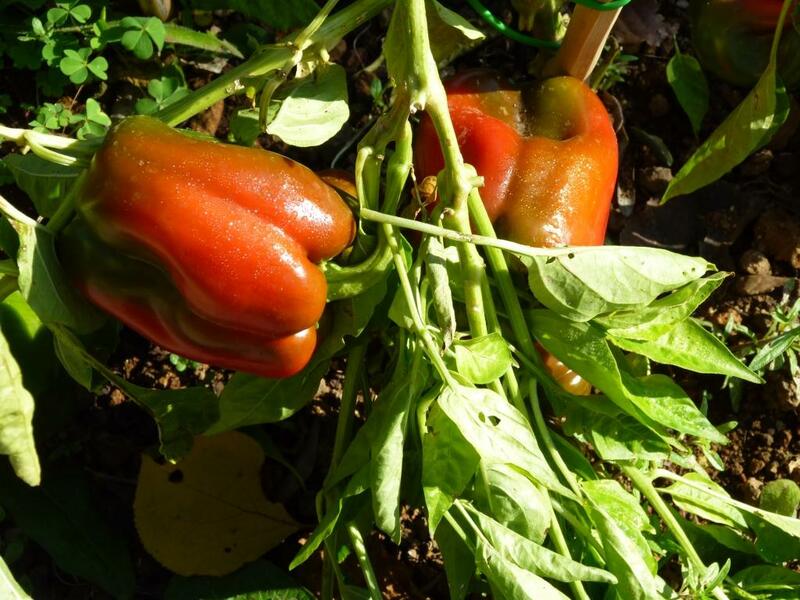 I still have some peppers growing outside and they still ripening slowly. 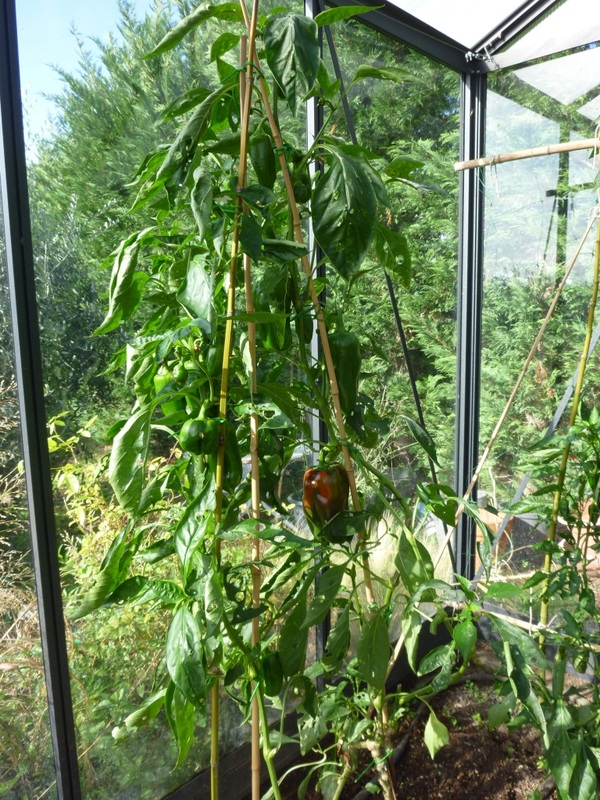 The two grafted plants in the greenhouse didn’t produce all that well during the summer, I think it was too hot and probably they needed even more water than I gave them. 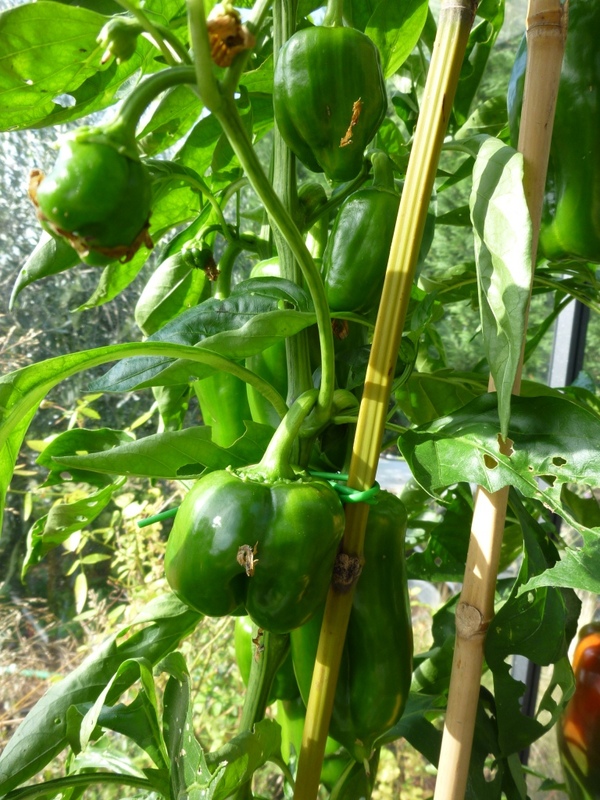 Now they have grown to over one and a half metres and have lots of peppers that are ripening well. They are larger and more ‘meaty’ than during summer. A couple of weeks again when I was listening to the podcast of Gardeners Question Time it was mentioned that a trail is being done to find out if peppers will over winter in a cold greenhouse during the British winter, this has encouraged me to think that I will try to grow these two plants as perennials. 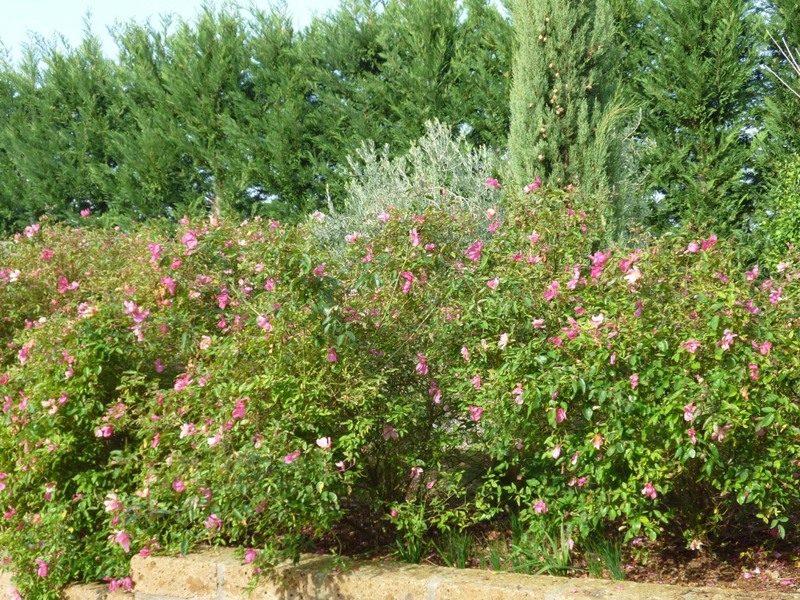 The programme suggested that during the coldest weather the plants would need to be cut back to the thick, almost woody, main stem. As the grafted plants should have a large established root system now, I am hoping that if they do survive the winter, the root system will be better at taking up all the water available and that they will produce more even during the very high temperatures of July and August. The plants are covered in fruit and I have pinched out the all the growing shoots and picked off the top flowers hoping that all the fruit will ripen. I will let you know how they progress. 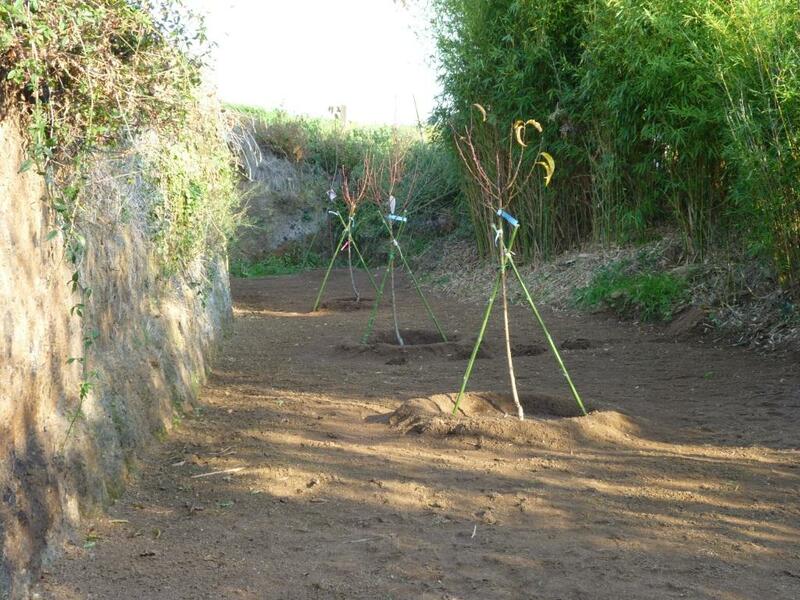 I mentioned some time ago that I wanted to plant some fruit trees in an area that is outside the fence in a zone protected from the north winds by the slope of the land and a tuffo ‘cliff’ – I’m not sure what you’d call it really; the perennial weeds were removed and it was all ready to plant when the flood from the surrounding field engulfed the area in a layer of mud. This occurred in September and the ground is still very damp. After the flood lots more creeping grass (gramigna) grew as the farmer had spread seed to grow to feed his sheep! So last week I went and chose some trees. I wanted to try some peaches and was, as usual, pleasantly surprised by the variety on offer at my local supplier. I opted for three peaches which should fruit in July, September and October; I chose late flowering and fruiting varieties as having tasted those available in the shops these later varieties have a more interesting flavour and the late flowering should mean that they won’t be damaged by a late frost as has happened repeatedly with an Apricot that I planted in the vegetable garden as quite a large specimen and that I intend removing. I also planted a cherry. 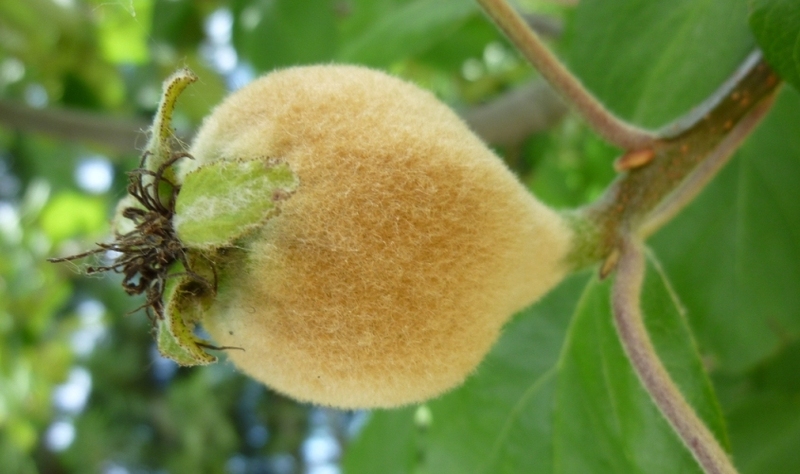 I want to try and grow the peaches as espaliers but I couldn’t buy whips so will have to try and prune the small trees as best I can – any advice would be very gratefully received. I thought it was, perhaps, a German variety. 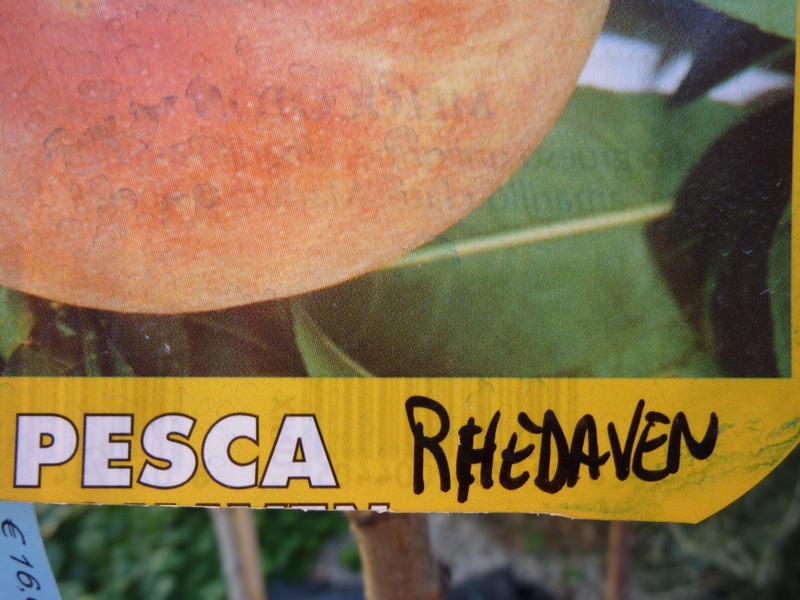 An amusing addendum to the purchase of the above is the labels, some of which were handwritten, obviously incorrectly copying the English Red Haven and changing it to Rhedaven! What else is happening? 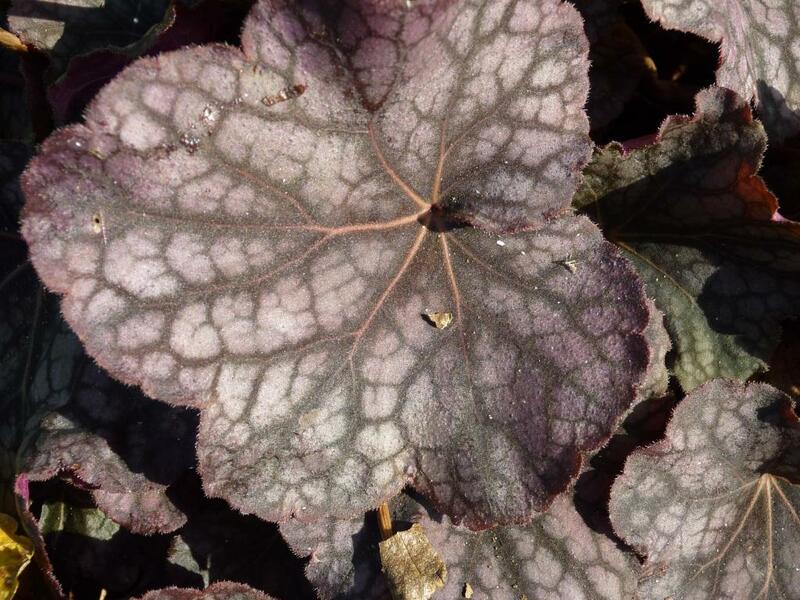 Well, despite the mild, warm, sunny days most of the plants know that winter is approaching and their leaves have changed colour or they have dropped. The wisteria is still hanging on but only just. 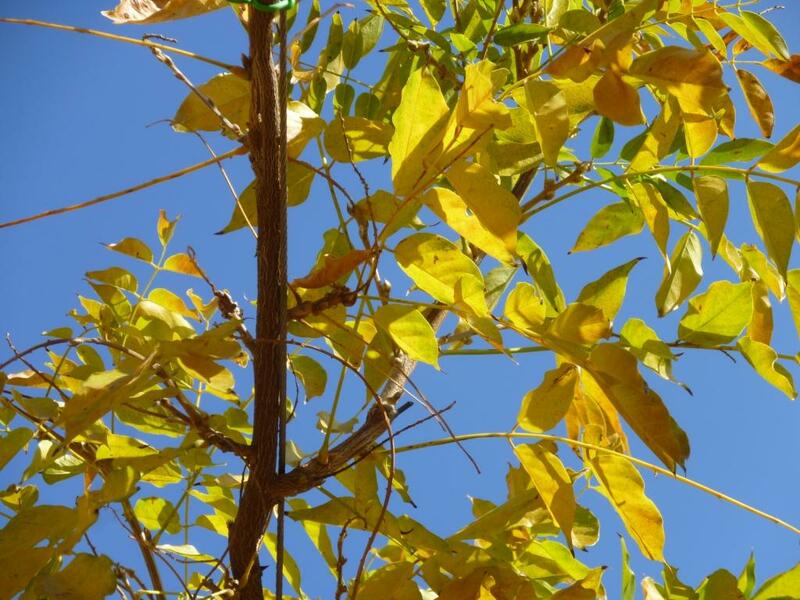 There seem to be more leaves that have changed colour this year rather than just losing their leaves, this must be a result of the long, slow, gentle change from summer to autumn to winter. Walking around the garden today it was the light that I found so enjoyable – the sun is so high in the sky in comparison to in England, for me it made the day seem like a day in September or May; it was so pleasantly warm and the sky such an intense blue I just wanted to soak in the moment. 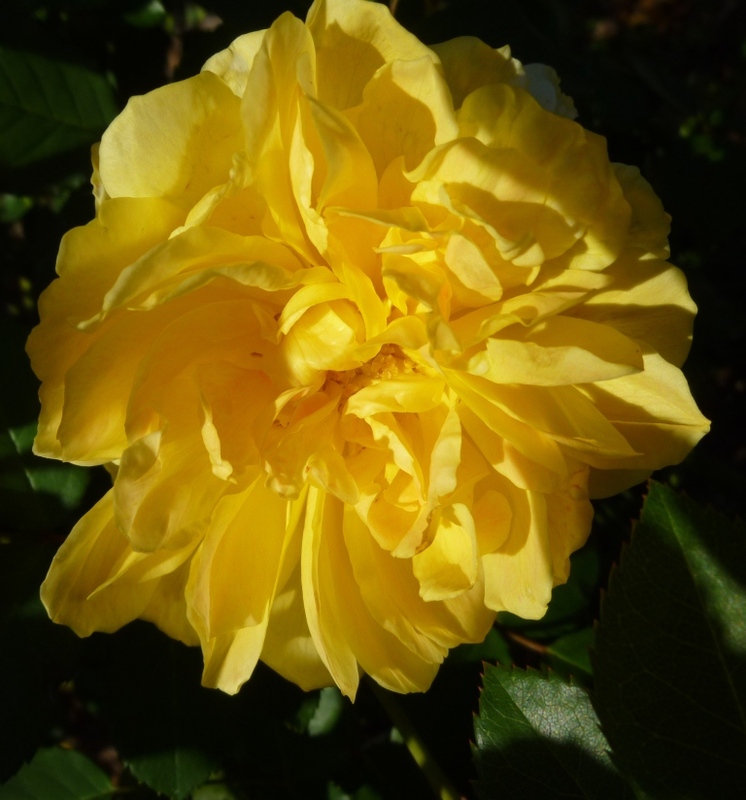 Rosa Westerland’s sunny colour seems to sum up the warmth of the day. 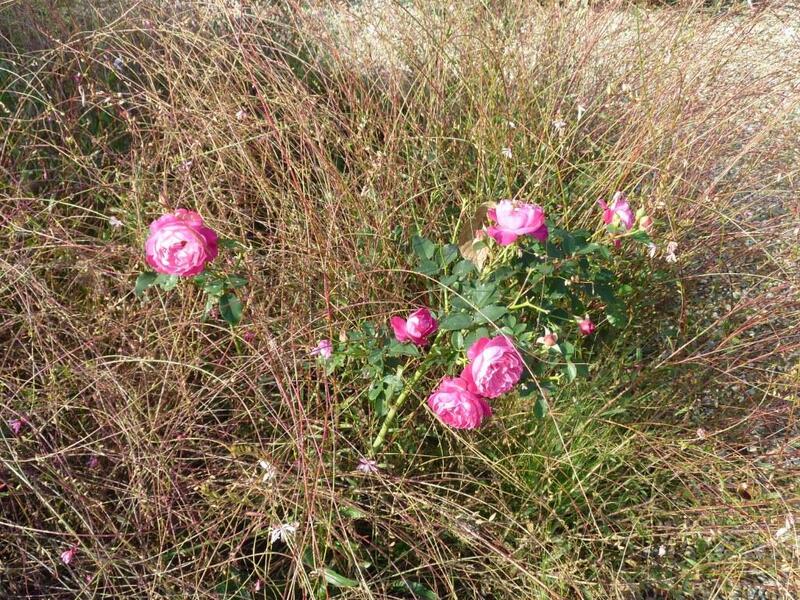 Even though the Gaura was still blooming in the circular rose bed I decided the time had come to free the roses from the heavy growth that was choking them. The small seedlings I had left in the bed last year had grown dramatically, instead of a small root system there were tuber-like, hand-sized roots with a huge capacity to store nutriments and water. Many of these I’ve potted up; someone will surely want them next year, many I’ve moved onto the slope where due to the hot spring some of the small seedlings I’d moved there last autumn hadn’t survived the summer; I’m more hopeful that these larger plants will establish during winter and will be able to withstand the drought next year. 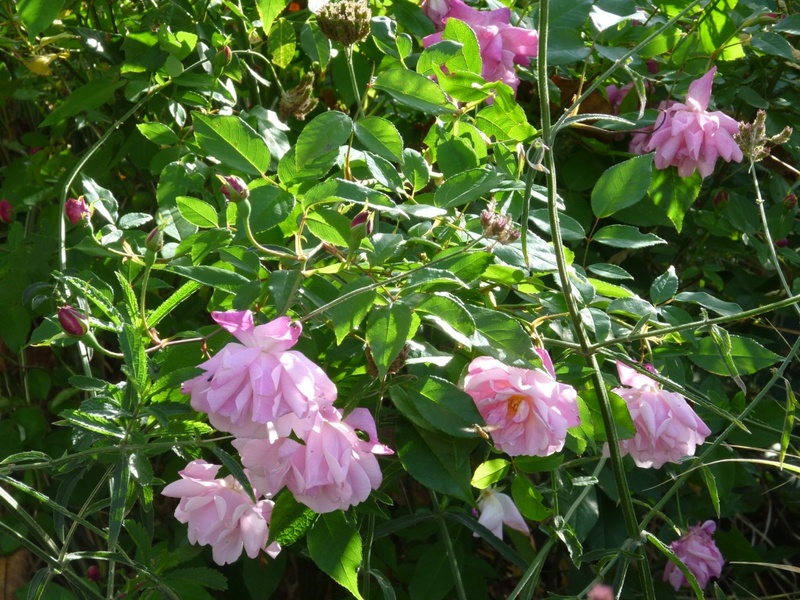 It is nice to see the rose bushes again and they will surely benefit from the light and air; I really must keep the remaining Gaura in check and not allow them to choke everything else next year – perhaps the Chelsea chop will slow them down. 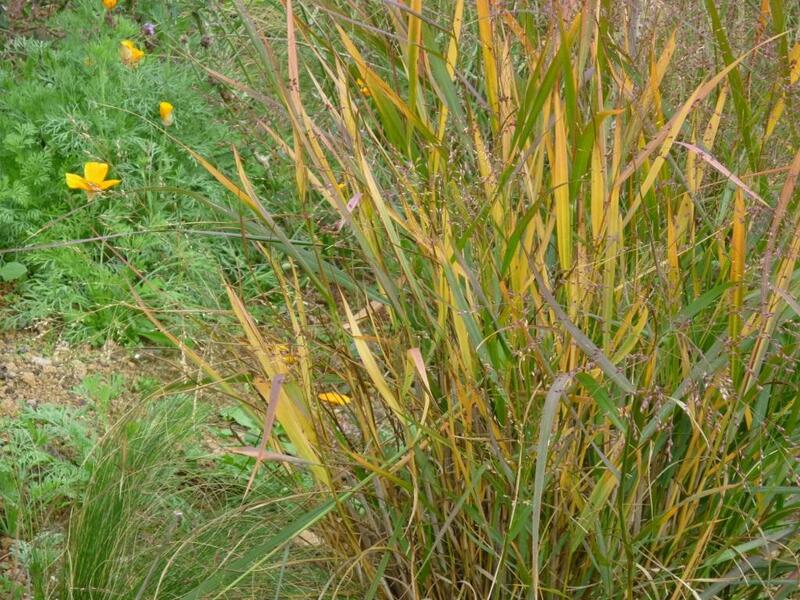 A Pennisetum villosum had seeded into the edge of the bed and is now a full sized plant, I need to move it elsewhere but I’m not quite sure where. 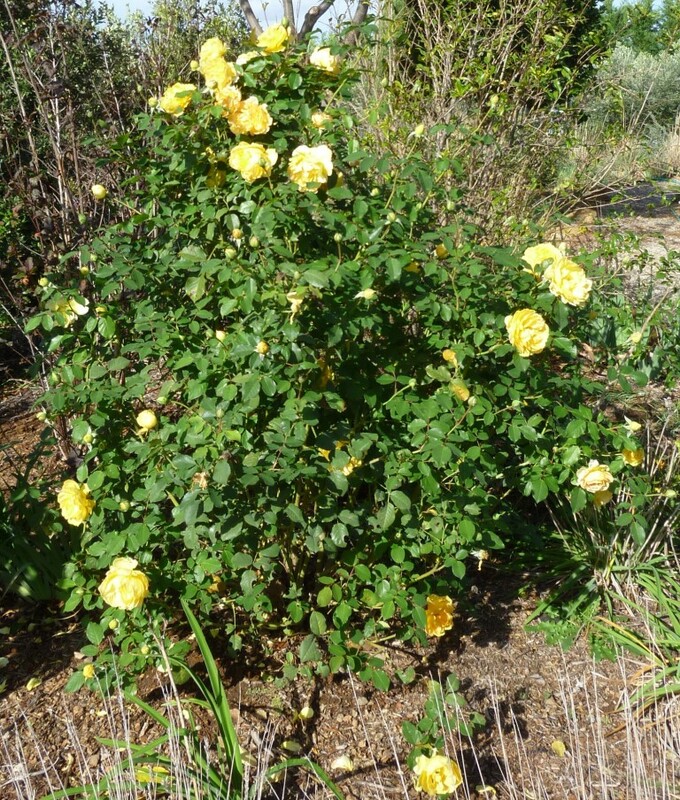 The bed looks very bare but at least the roses can now breathe! 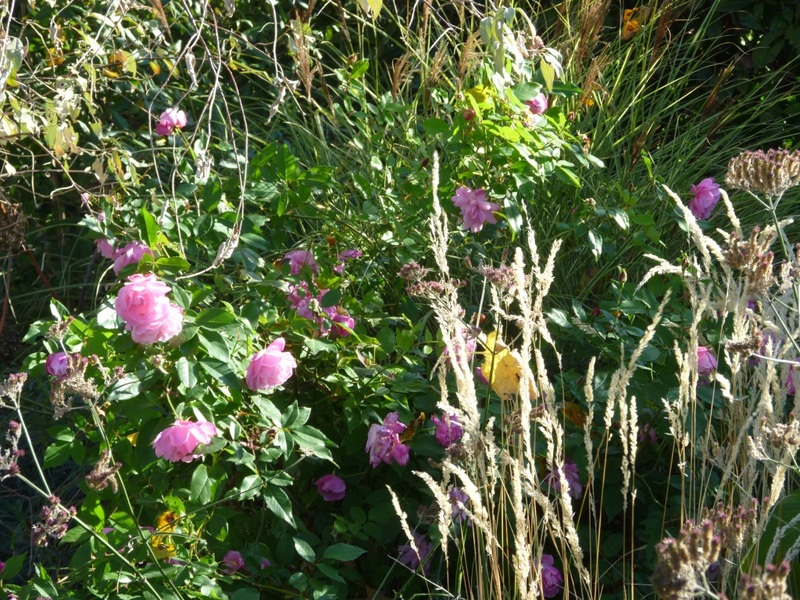 The garden reveals its treasures in a relaxed way, the days make you want to linger and search for all that is changing. 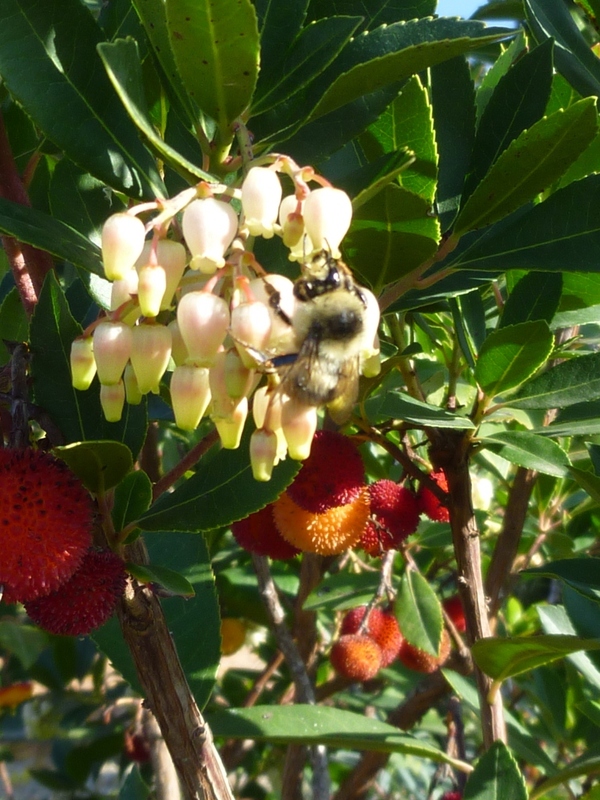 My last image is an Arbutus – its shiny, evergreen leaves combining with the ‘strawberry’ fruit and white flowers to attract a still-active bumble bee, it is a different variety than I usually see in the garden. 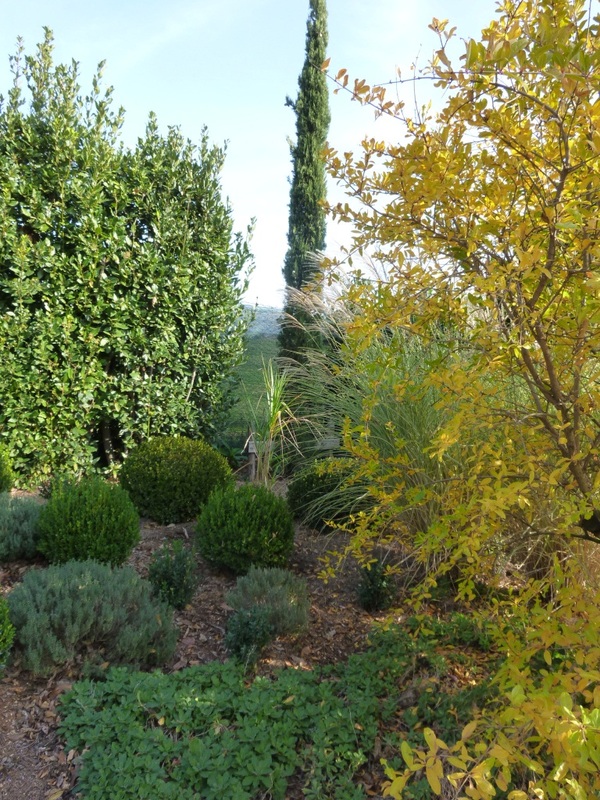 The change in the weather since last foliage day is very noticeable. Now the mornings are cold; early one morning last week there was a frost, although it must have been very light as nothing has blackened and the roses are still opening their blooms; during the middle of the day the sun shines and it is still pleasantly warm – warm enough to sit on the terrace with a grass of white wine and enjoy the rewards of a morning spent tidying up in the garden. As soon as the sun begins to drop, it is cooler and a fire is a cosy addition to the evenings. 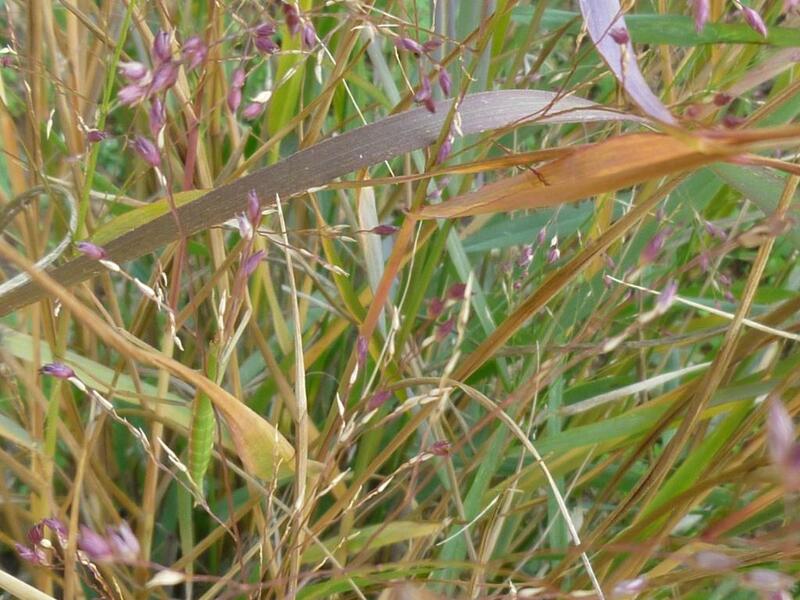 Just a few days separate when the above images of the Panicum were taken. Change is fast, once it begins to happen. 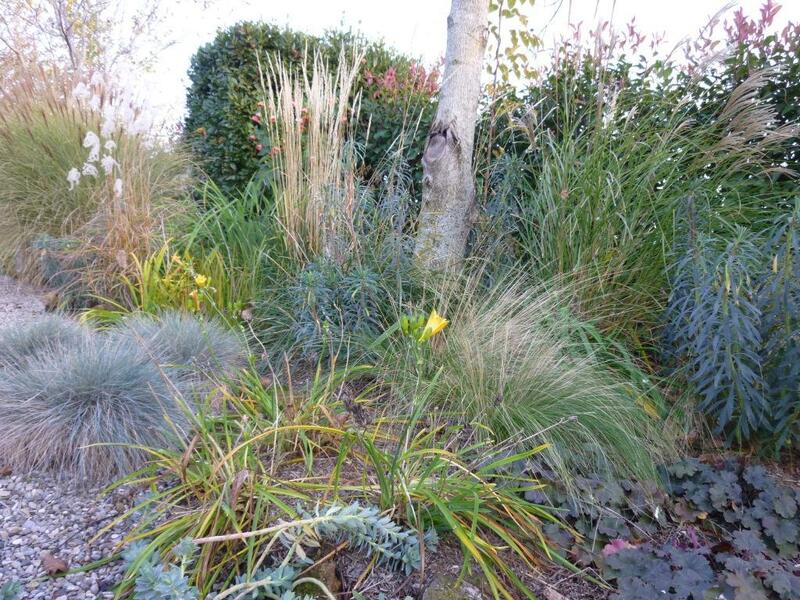 Even though there are more plants blooming than is usual in November (see GBBD November), it is the foliage that holds the garden together, creates colour and texture that work on their own or as a vital support for the few splashes of colour that the blooms provide. Only the bright yellow of the dying Box (second plant that has died in this position) spoils this tranquil view. 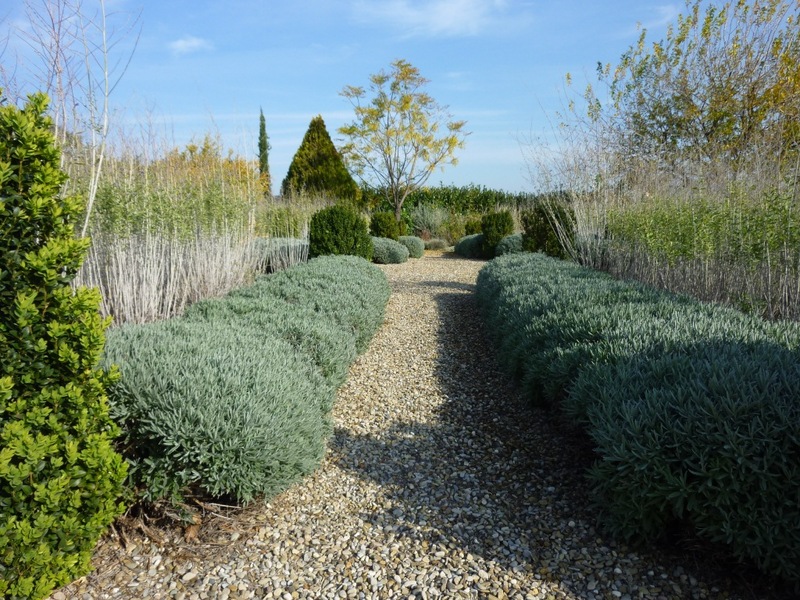 This month I thought I would concentrate on some overviews of the garden illustrating how it is the foliage doing the major task of creating stimulating vistas within the garden and leading the eye to the broader landscape. View towards the left hand border, the wide angle makes it appear a much longer path than it is in reality. 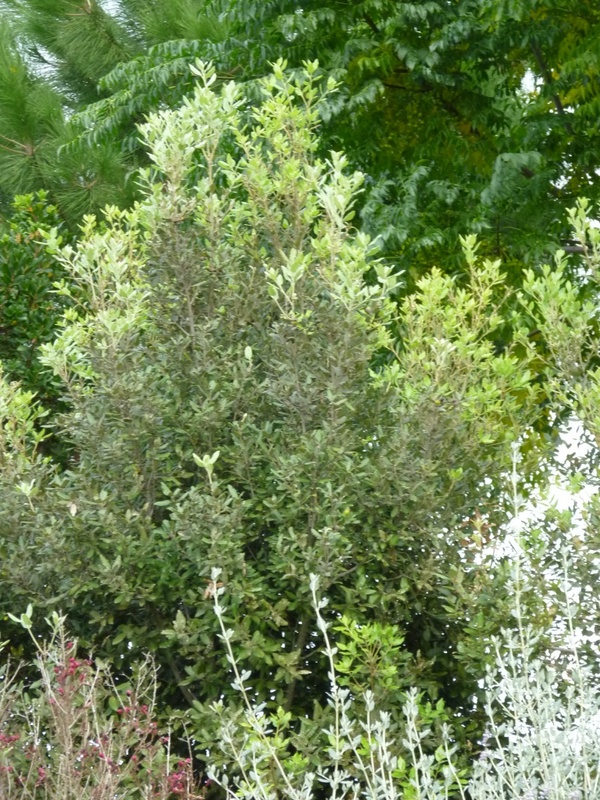 This angle of the garden is almost always satisfying, the solidity of the cypress combined with, at this time of year, the glowing yellow leaves of the pomegranate, the trunk of the fast growing Melia which decorates the sky when you look up with its bright yellow berries, the broad leaves of a Canna and the mat-forming, evergreen Verbena all make this everyone’s favourite spot to photograph. Moving around the pomegranate there are the box spheres with Bay hedging and a Miscanthus gigantea that will hopefully reach its stated 8 foot next year. In the back border blue leaved euphorbias, and dark claret Heuchera contrast with light reflecting seed heads of Miscanthus and Calamagrostis, while a couple of Hemerocallis are valiantly continuing to put up a few more flowers and the abutilon has nearly regained its stature from before it was knocked back to the ground in the minus 8°C temperature of last winter; its orange flowers picking up on the ‘spring’ new growth colour of the Photinia. 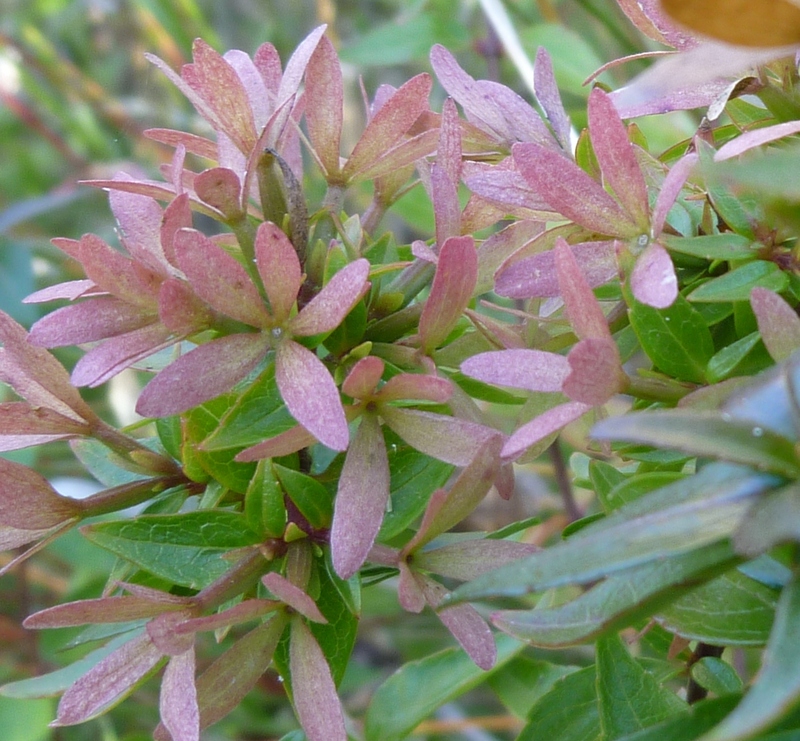 When I look closely at the self-seeded offspring of seed grown Euphorbias I am intrigued by the variation in colour, I like that they turn pink with the cold as does my face when I work out in the wind! 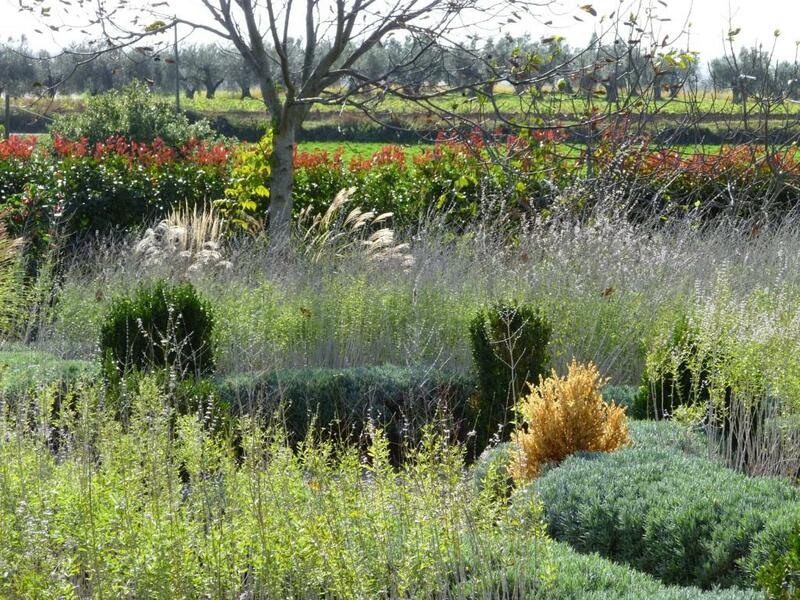 View across the large island to the greenhouse and the ever-present sparkling foliage of the olives. 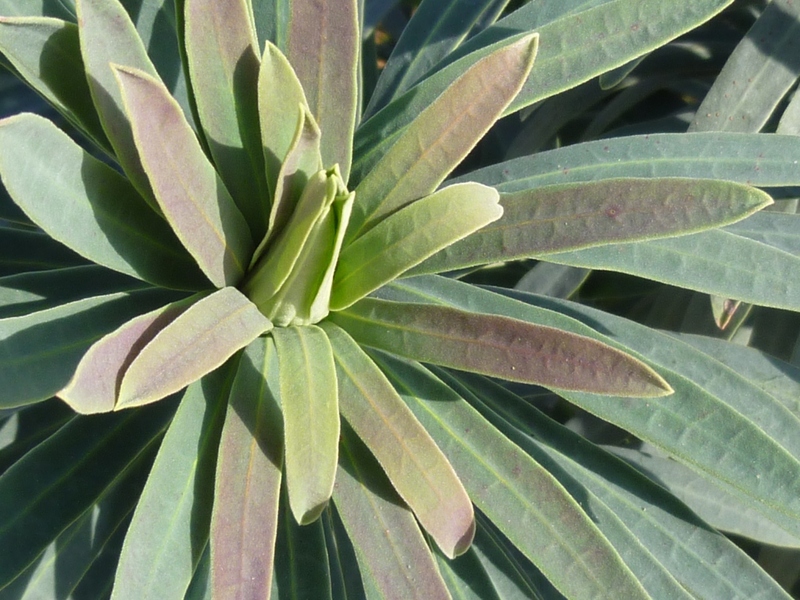 What foliage is adding to the enjoyment in your garden? Is it autumn colour? maybe too late for that now; or evergreen plants that are ignored in summer to return to notice when the splendour of summer is past? Do share; just add a link to your post when you leave a comment. Pam at Digging also has a foliage meme which is usually the day after Bloomday, too soon for many of us to be able to get a second post up, here’s the link to this months post. And to finish, nothing to do with foliage at all; just look what I picked yesterday! 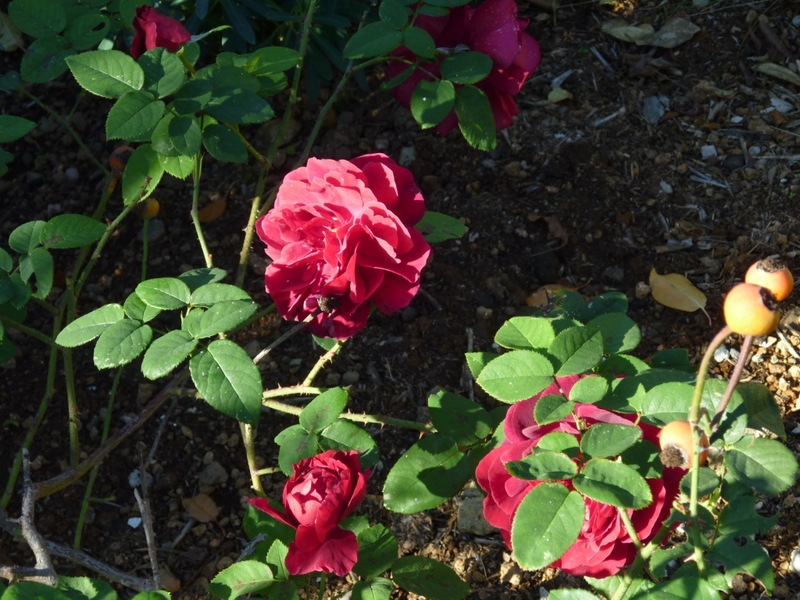 I think there are as many, if not more, flowers blooming as there were in October. 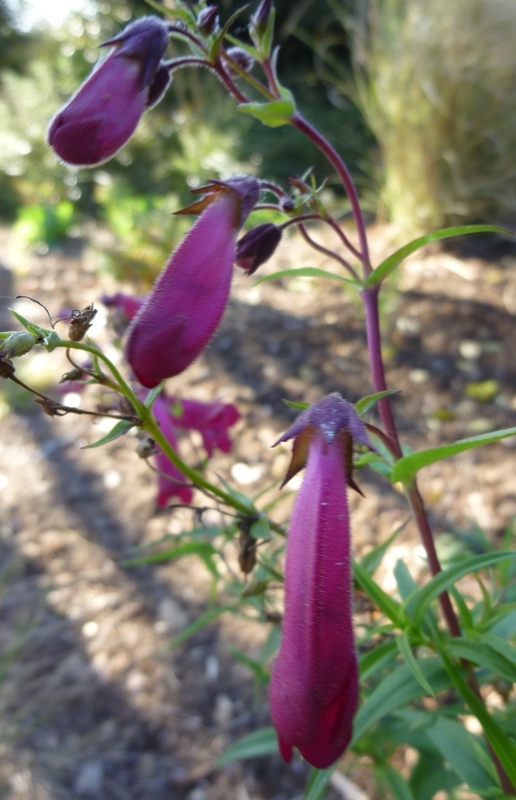 Even the Philodelphus has a couple of flowers. 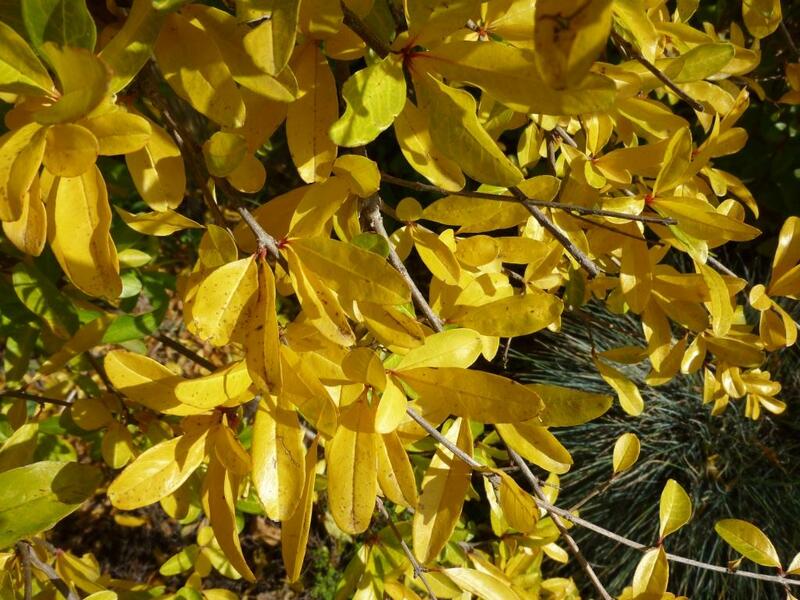 In my last post I asked whether it was spring or autumn; there is still a lot of new growth on many shrubs but all of the trees have either lost their leaves or their leaves have changed colour so the answer to my question is now it is autumn. Almost every variety of rose I have has blooms; outstanding are the usual suspects of Rosa mutabilis plus R. Molineaux which looks as good as in spring and R. China Rose – this was given to be by a friend as a rooted cutting it is today looking wonderful, I had been thinking of moving it but until I’ve taken some cuttings myself and know that they have taken I don’t think I would want to risk losing it. 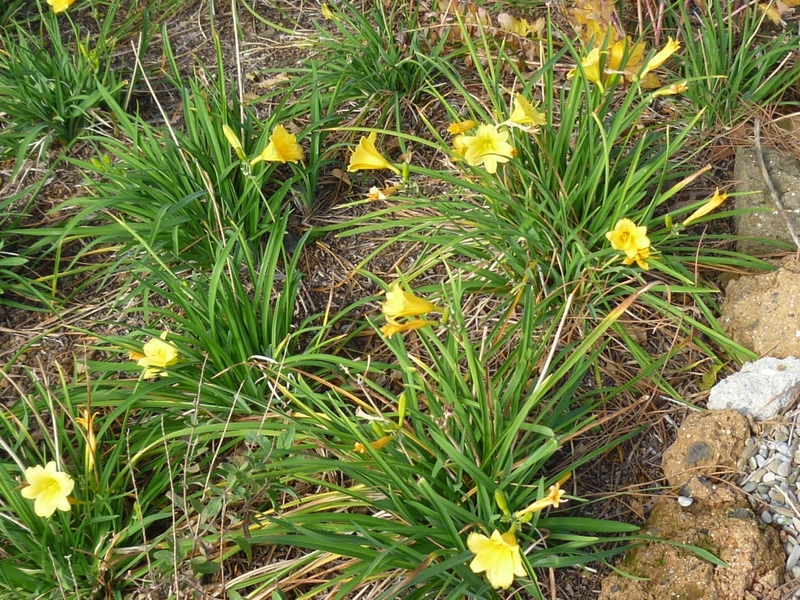 It’s companion planting of Hemerocallis Sol d’oro. 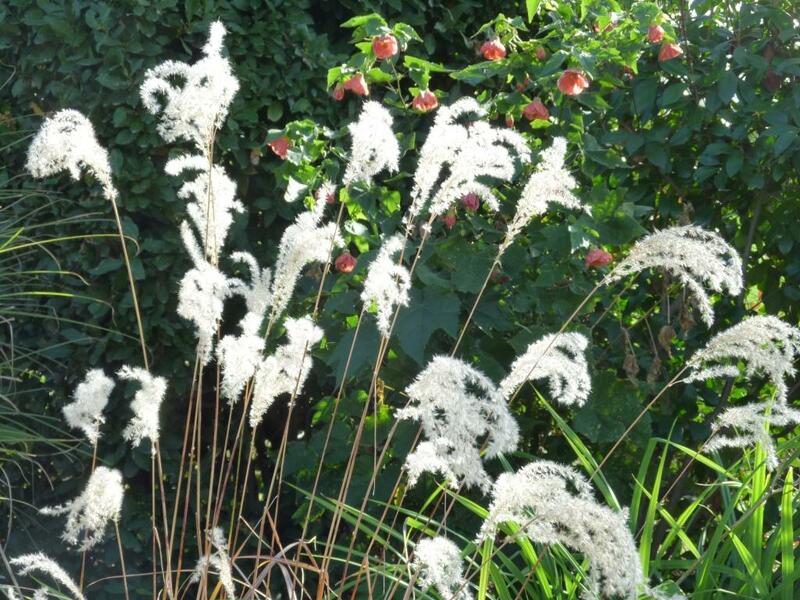 I love the light at this time of year – it is so bright (difficult for photographs) and lower in the sky so it lights up the grasses all day and not just in the evening as in summer. 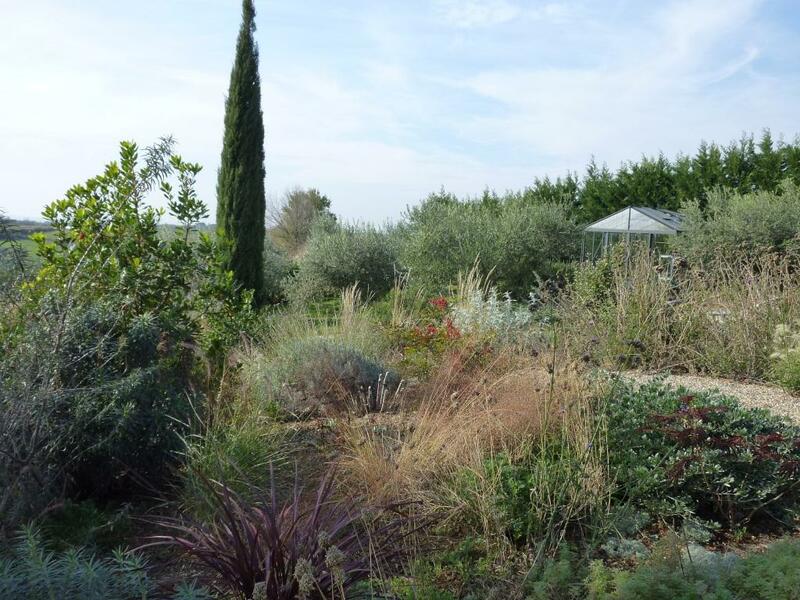 Reading about gardens in other parts of the world where there has already been frost or snow makes me realise how lucky I am enjoying this extra-long season of good weather. I’ve only just put the heating on in the last couple of days and then only for a couple of hours in the evening. I have been changing a small area around the Arbutus. 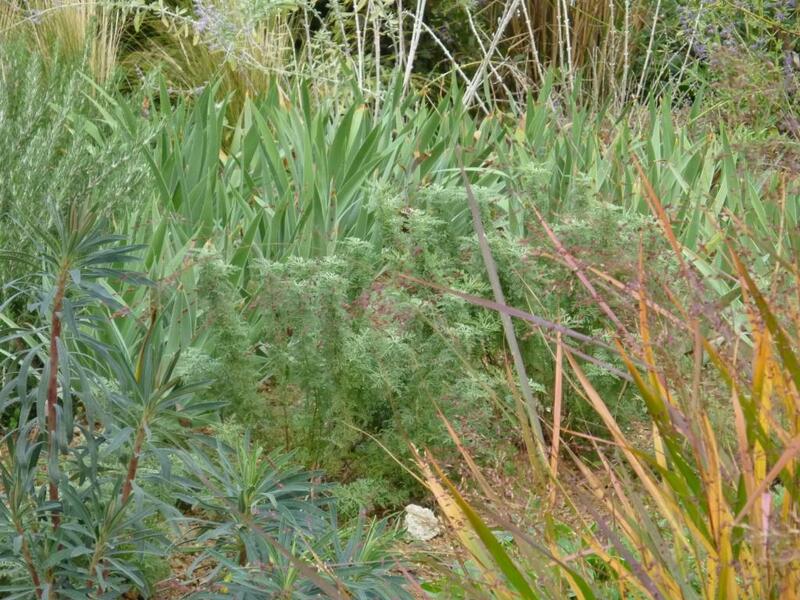 It had a strange mix of oddments that I’d put there when I didn’t know where else to plant them; I wanted to have an area with Asters for autumn interest, I also realised looking at images for recent posts that I have quite nice mix of plants all with crimson blooms, I have decided to put them all here adding to an Oleander and Salvia of that colour. The rose will be to be moved later in winter but I’ve moved a Penstemon (a cutting from Linda’s garden in the West) and divided some claret achillea’s to extend the period of interest, so this area will be crimson all summer hopefully, next autumn I’ll put in some crimson tulips too to stretch the season even more. 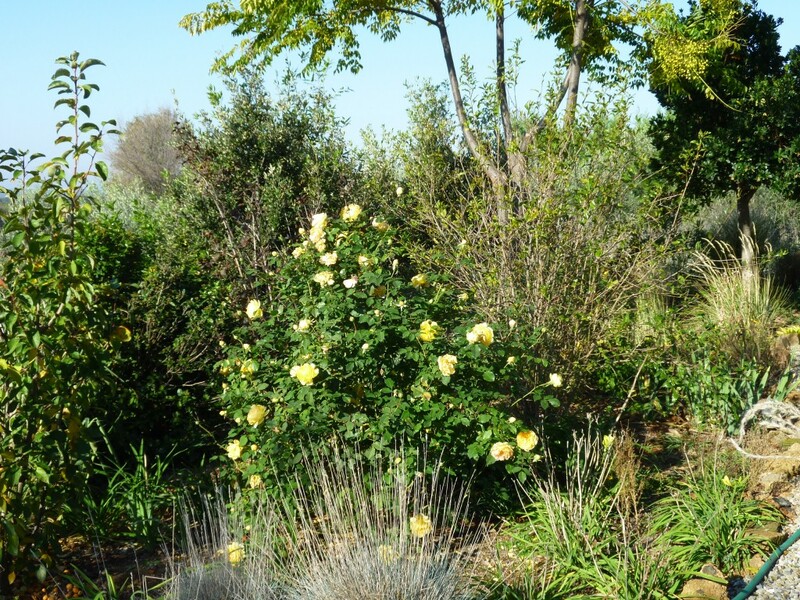 Click on the image below to see all the blooms in My Hesperides Garden this month. 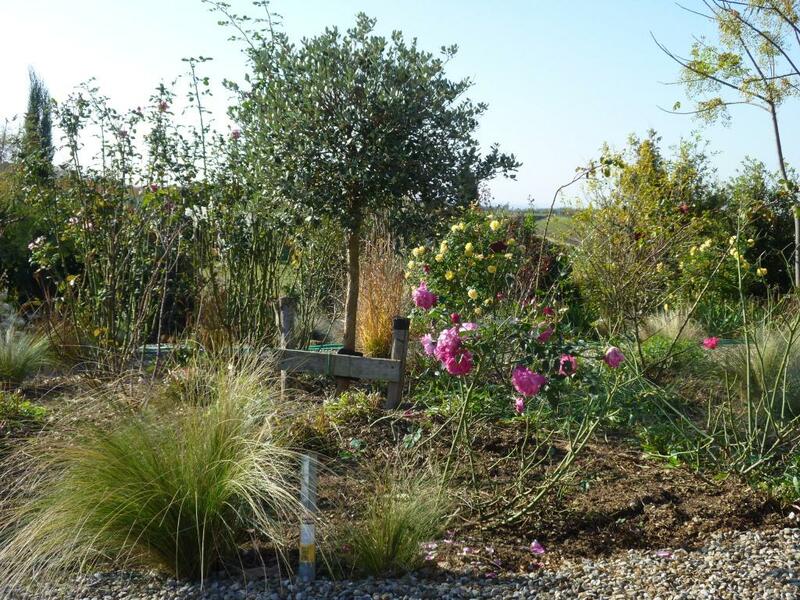 Thanks to Carol at MayDreams Garden for hosting GBBD, why not visit her and then see what’s blooming in gardens all around the world. 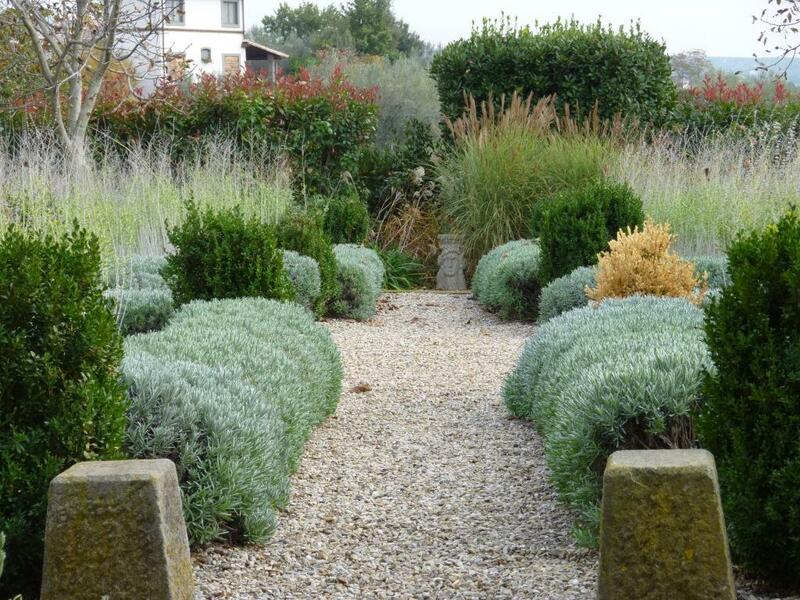 The weather continues to play tricks on the garden – the plants are confused; is it spring? Certainly the roses, Hemerocallis and Photinia think it is; even the Quercia ilix have put on considerable new growth in the last few weeks, the colour of the new foliage is very obvious. 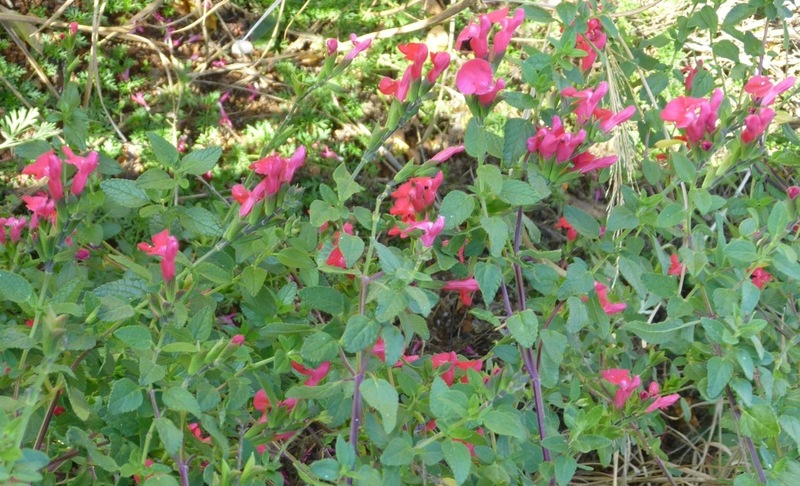 Rosa mutabilis hasn’t had as many flowers as this since spring. 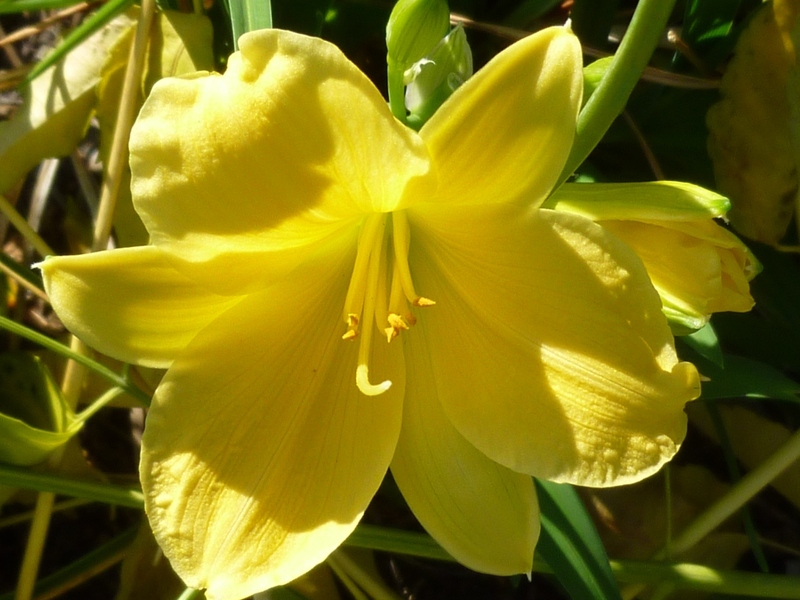 Hemerocallis are full of flower creating the same combination as in spring with R. Molineux – this is the rose that really does believe it is spring it has so many flowers and buds I can hardly believe how lovely it looks. 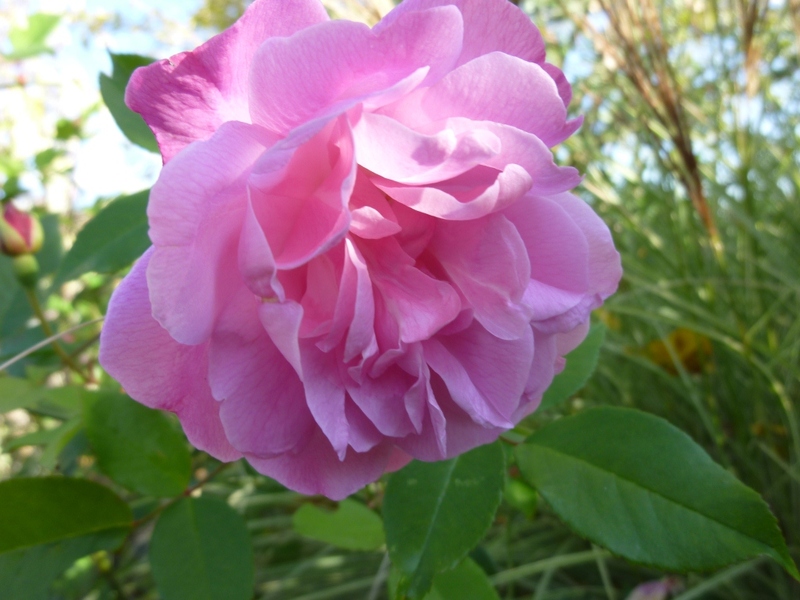 R. China rose is growing so well; I had decided to move it but it is now growing so well I don’t want to risk losing it, perhaps it would be better to take some cuttings and when I know I have a safety net I can risk moving the parent plant. 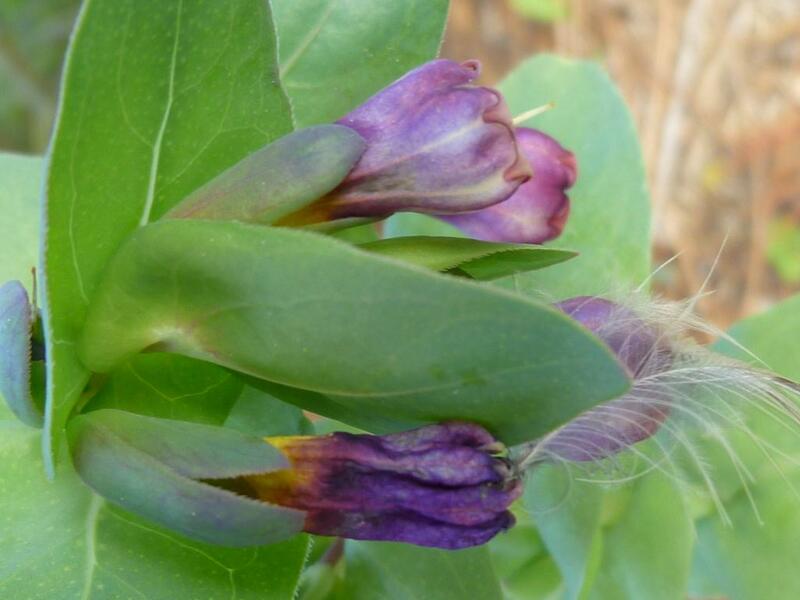 Cerinthe major purpurascens certainly thinks it is spring or at least not autumn as sometimes it does flower very early in the year when it is still winter. On the other hand, the walnuts and fig have now lost most of their leaves so they know that winter is not so far away. 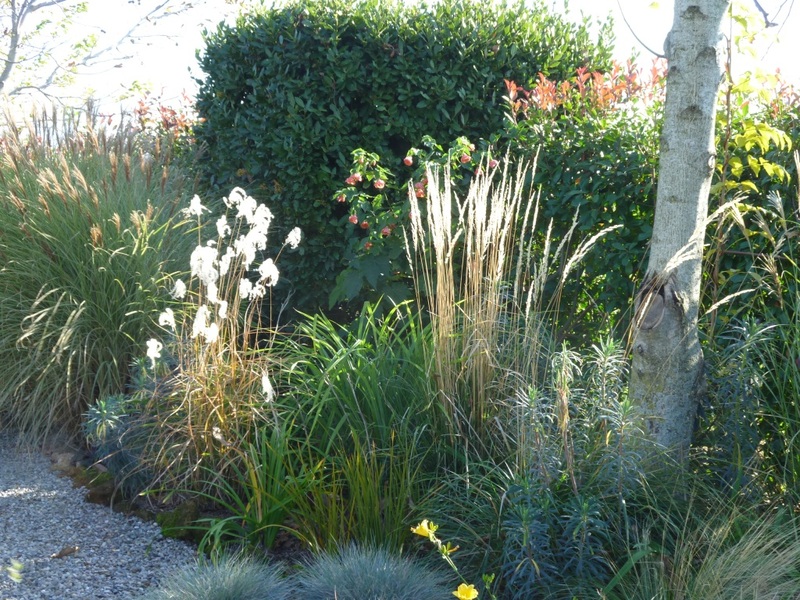 All the grasses are doing what is expected of them in autumn – that is looking wonderful with the low sunlight shining through them. 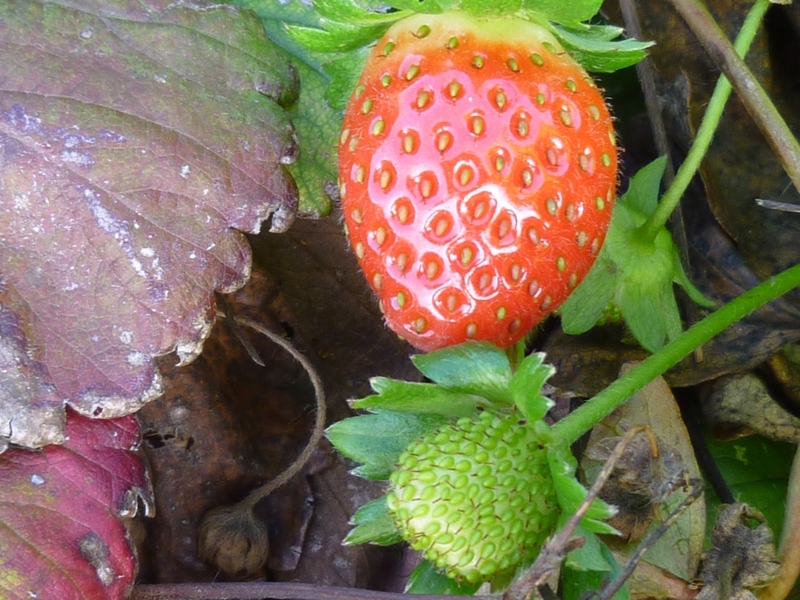 The strawberries are still providing a few tasty mouthfuls and the flowers promise more to come. Rain has fallen this week, but more as April showers than the heavy rain of autumn (we have been lucky, you will have seen on the news the terrible floods that there have been in Liguria, Tuscany and in Torino); but the temperatures have remained very mild, still no need for central heating, so the question remains “Is it Spring or is it Autumn?”. This is very late, I have been sick, nothing serious but it meant I didn’t feel my sparkling self and up to writing a post. Last month in this meme I wrote about the greenhouse and tomatoes, this month I’ll concentrate on the various fruits I grow and what I do with them. First the failures: I planted a large apricot tree (it cost €150) in the spring of our second year here; the first year because the tree had been in a protected position in the nursery while it was in flower, it had some fruit. 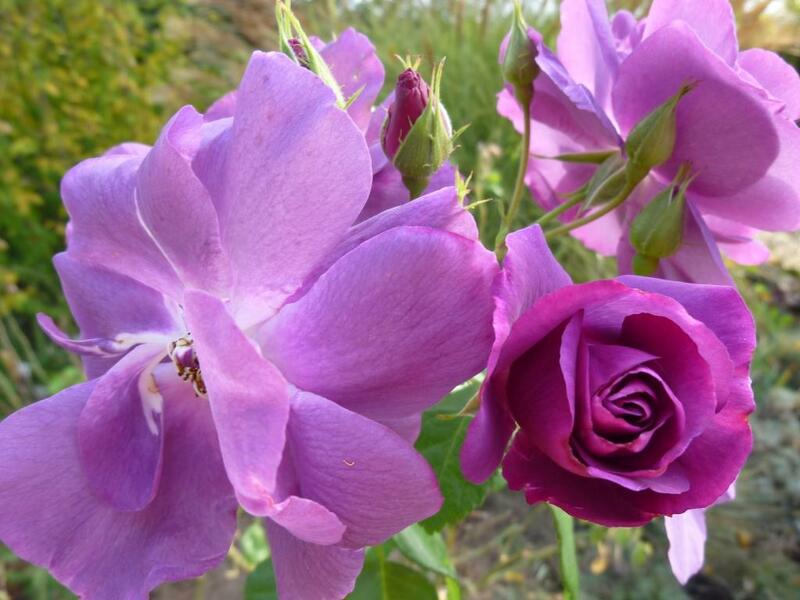 Since then there has always been a frost or a very cold wind just as it was flowering and setting fruit and so no fruit! I showed images in spring of this year of the flowers turning brown and I knew then there was little chance of any apricots this year. The options are to try moving the tree, it is probably too large to do this so I will probably buy another tree (a sapling this time) and plant it in the area that is protected from the north and northeast winds that I have been preparing and hope for better things to come. 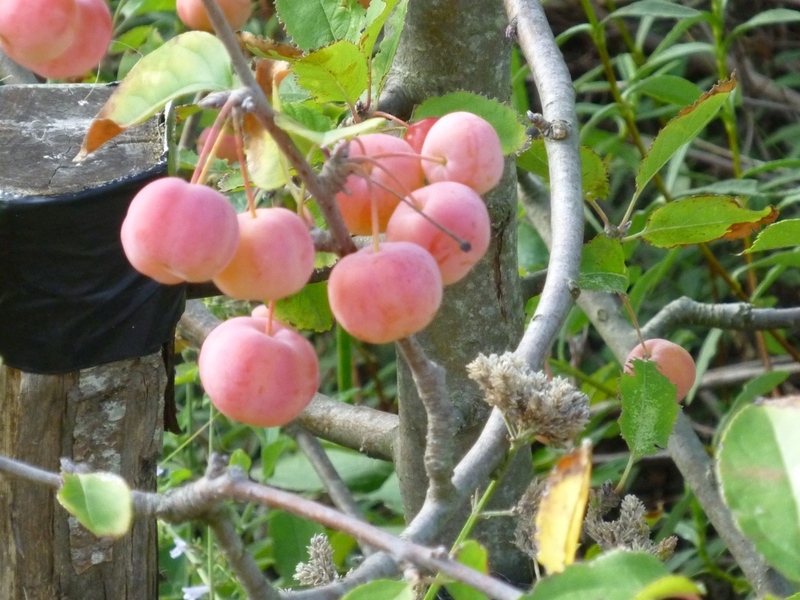 The other tree hit by the late cold wind was a plum, this tree was already in the garden is probably a wild form, the fruits are always small but usually there are lots and they taste good, this year nothing. I have tried to grow currants, red and black with no success at all. 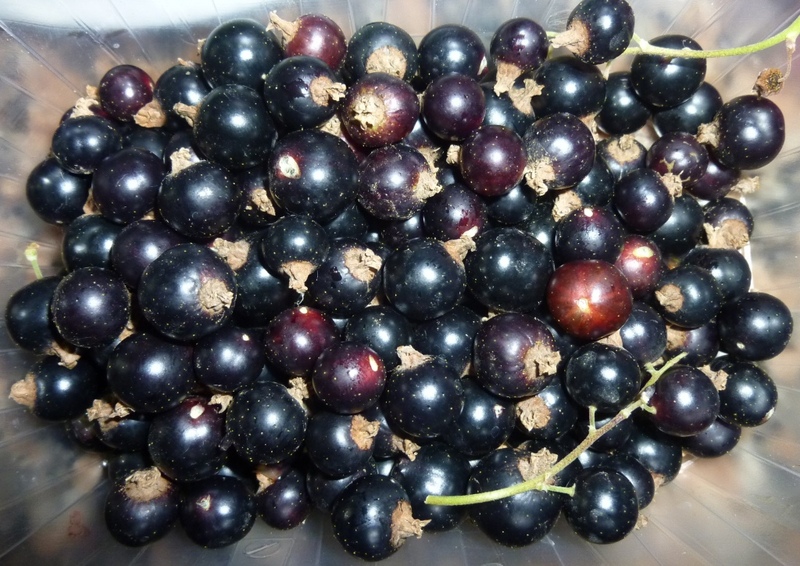 There is just not enough water for the blackcurrant and though it doesn’t die it only produces a small handful of currants, not enough even for a summer pudding. this is the entire crop! The redcurrant has grown amazingly this year but again with very few fruit I have taken the view that I should grow what is correct for my conditions and not fight nature by trying to grow things that I grew and loved in England. This week the currants have been removed and will be given to a friend who lives much higher where it is cooler and she has a better water supply. 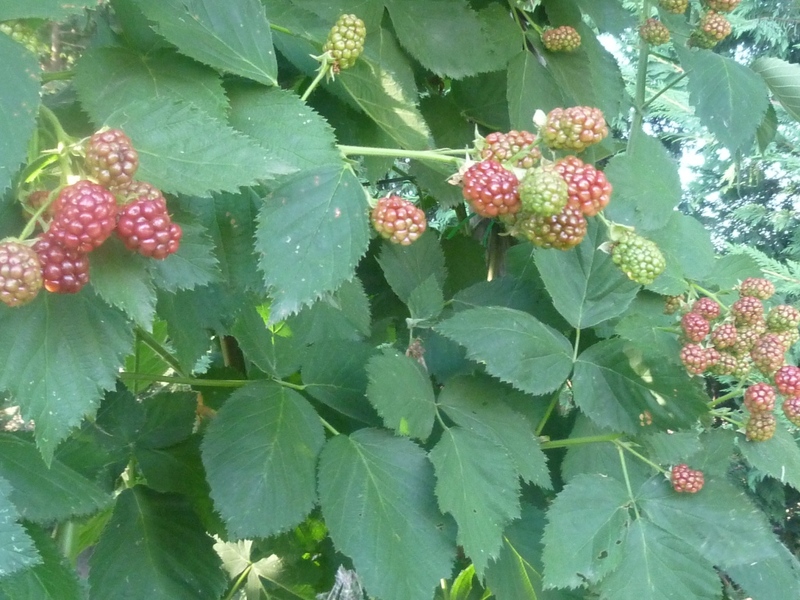 Blackberries on the other hand grow very well but the variety I’ve planted are strange. The fruit ripens from the tip back and the black tempting parts are eaten by the birds before the whole berry is ripe, however worse than this is the fact that they aren’t actually very nice blackberries, not sweet and lacking in flower, again I made the decision to remove them and will try to get cuttings from a friends plant that I know is delicious. There is no point spending time and effort and vitally expensive water resources on plants food or ornamental that don’t give satisfaction. 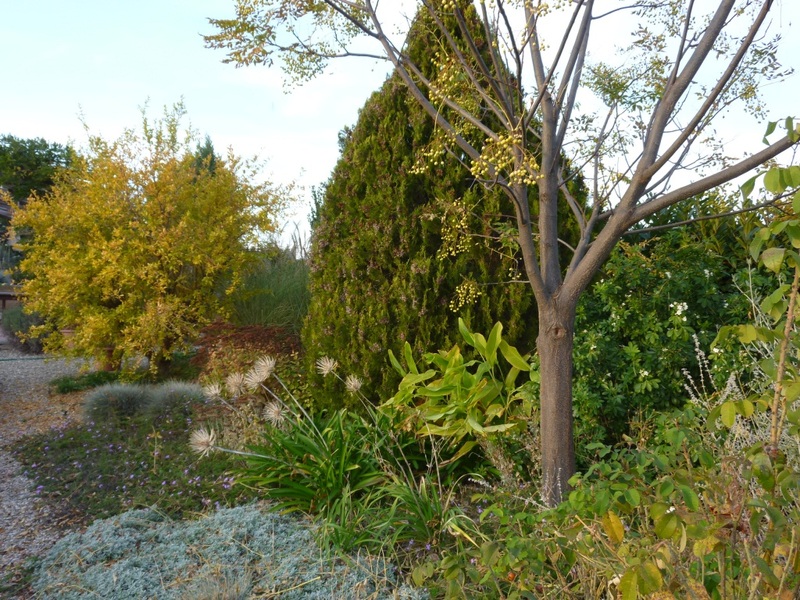 There are 2 walnut trees, planted in the back border; these are what remain of the 6 or 7 walnut trees that were here when we bought the property. They have always been diseased and produce very few healthy nuts, I should probably remove these too but they give shade to the back border and provide privacy. 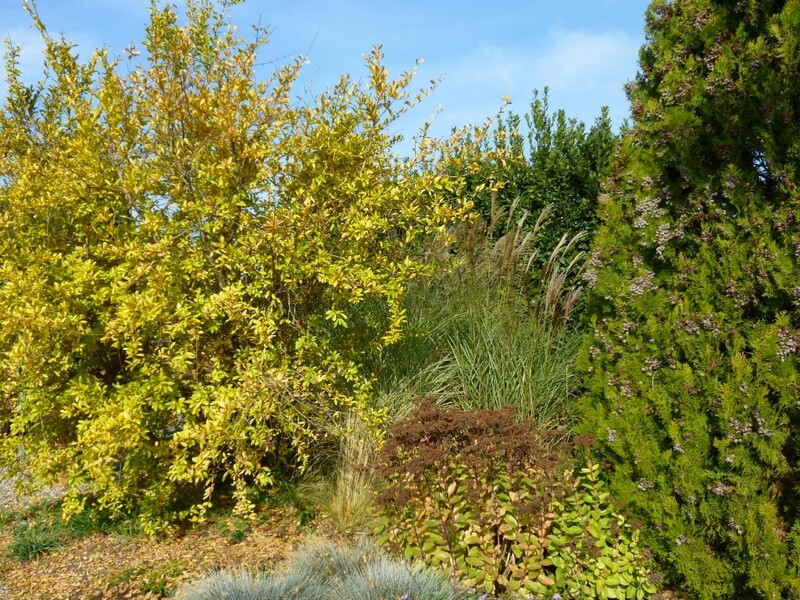 It would be nice if they were something prettier – they don’t give autumn colour, have already lost almost all their leaves and I know they put out a chemical into the soil that inhibits growth in other plants. 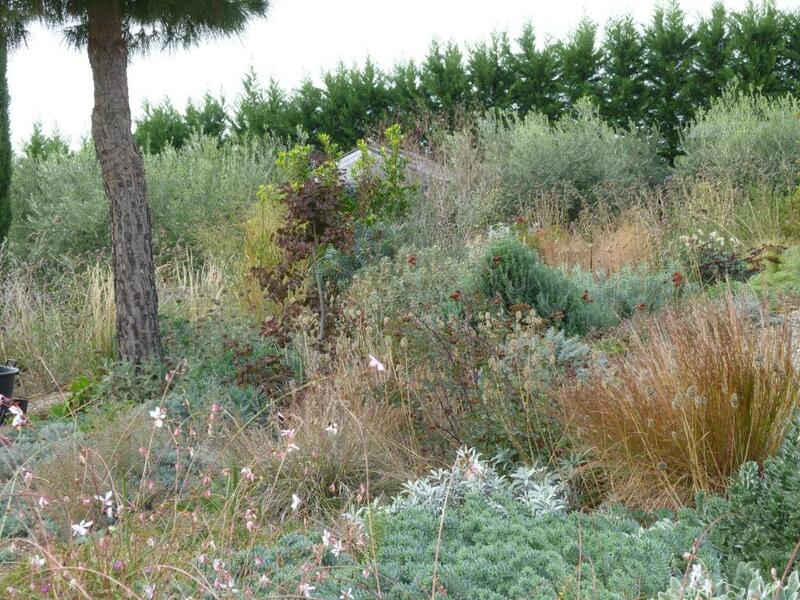 But it is not all gloom and doom in My Hesperides Garden. The quince has produced masses of fruit this year. 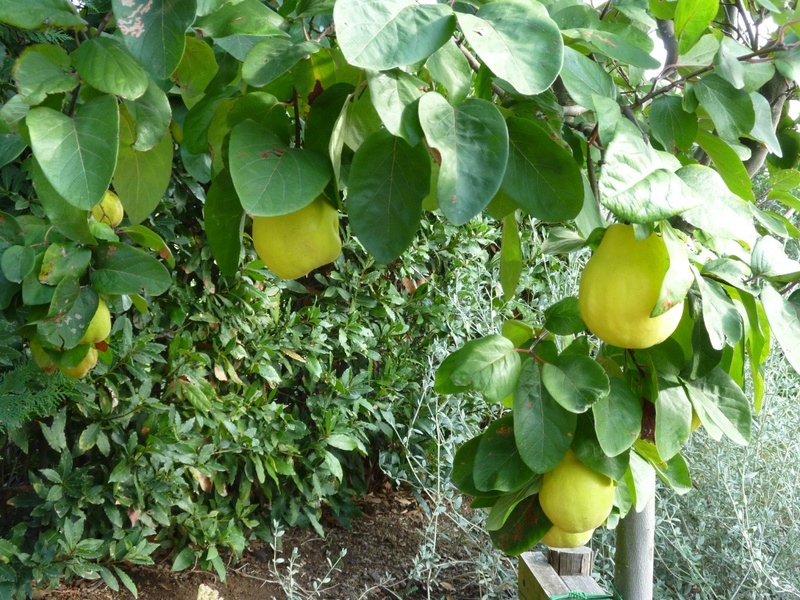 The quince was the ‘golden apple of the garden of the Hesperides that Hercules had to collect as his 11thlabour so it is fitting that these grow well in the garden. 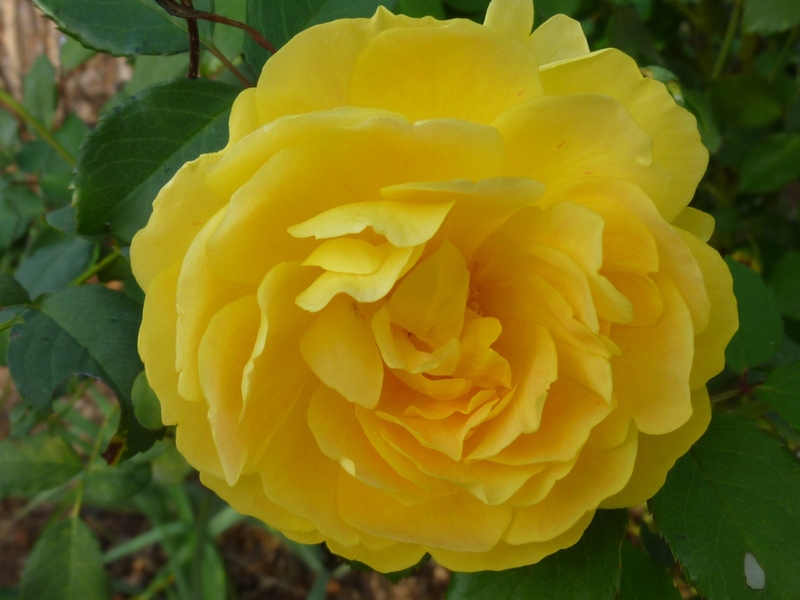 The blossom is lovely is spring and the fruits glow yellow as they ripen. The furry fruits are very attactive too. 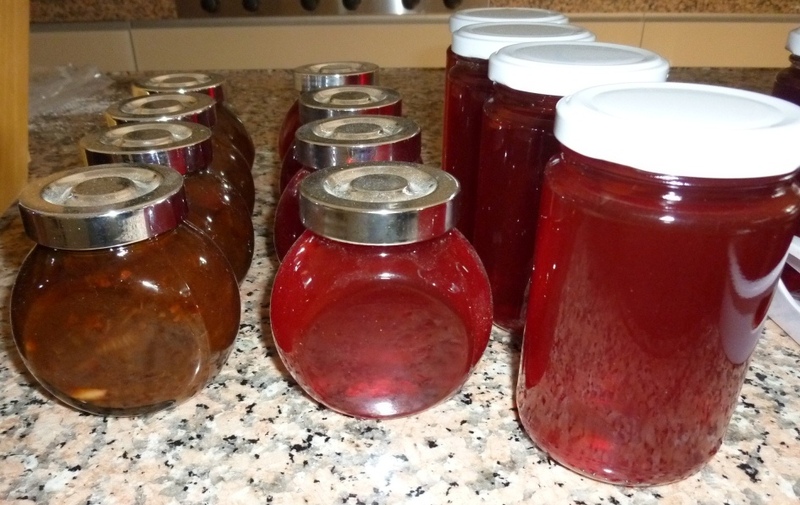 I have made two kinds of jelly one sweet and the other picante with the addition of chillies to the pan while the fruit was cooking – I serve this Italian style with cheese. 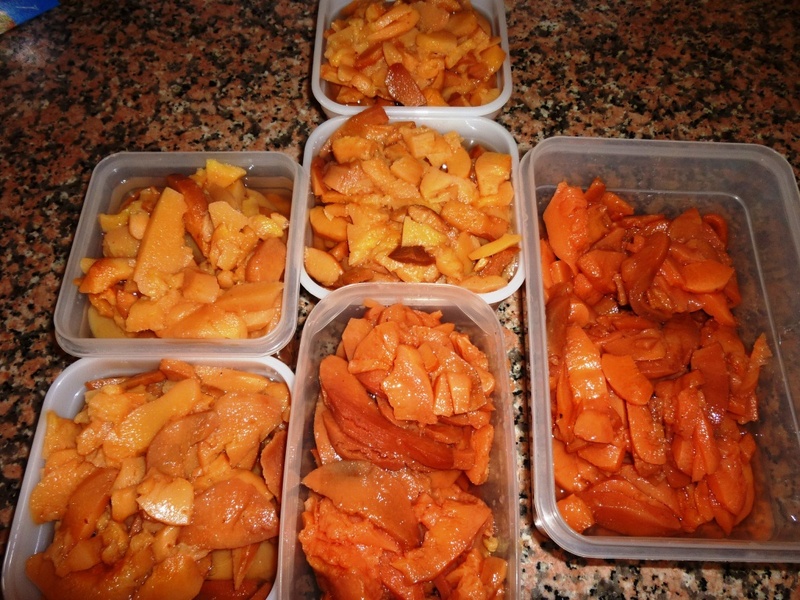 The rest I cooked and have frozen to eat as stewed fruit during the winter. I love the perfumed flavour of quince and I’ll try it in pies and crumbles this year. 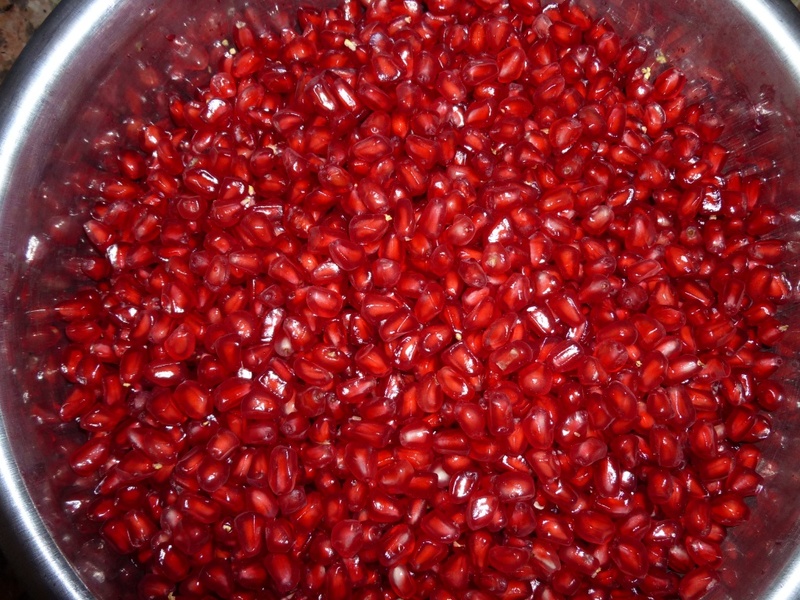 I love pomegranate juice, especially when I have a cold, the tree hasn’t produced as much fruit as last year but enough, I’ve also been told that pomegranate jelly is delicious so I must look that up and try it. 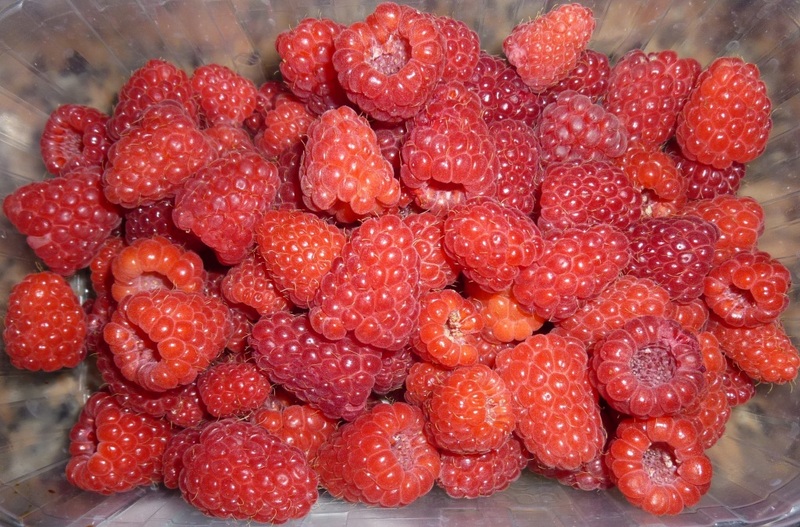 I’ve spoken about the raspberries on numerous occasions, the crop was large, I tried to eat some fresh every day I harvested them and then froze the rest to make jam, coulee, ice-cream and crumbles throughout the winter months. The autumn fruiting plants didn’t do as well as last year but I think this was the fault of my pruning, they all fruited together and for such a long time I’m not complaining. One perfect fruit was even picked yesterday. There can't be too many raspberries! 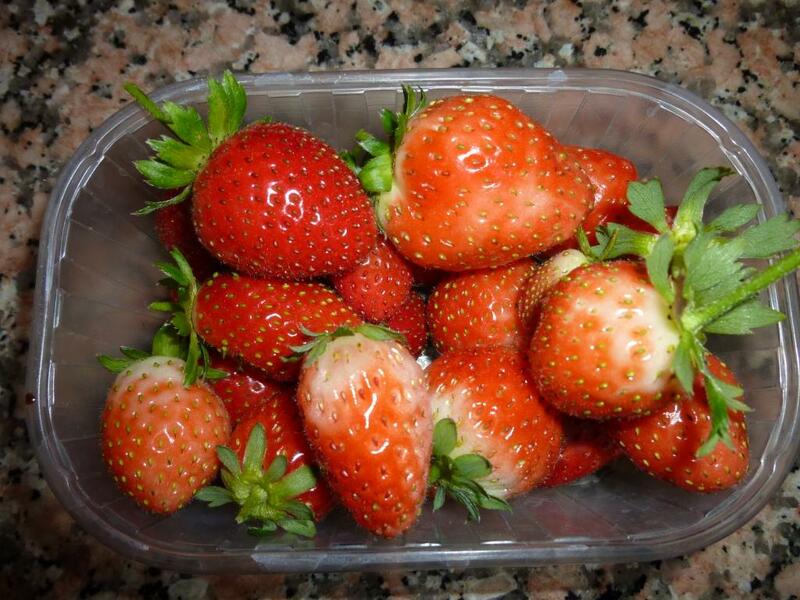 In England I lived near a ‘pick your own’ so never bothered with strawberries, it was easier and not expensive to just go to pick when the fancy took me. 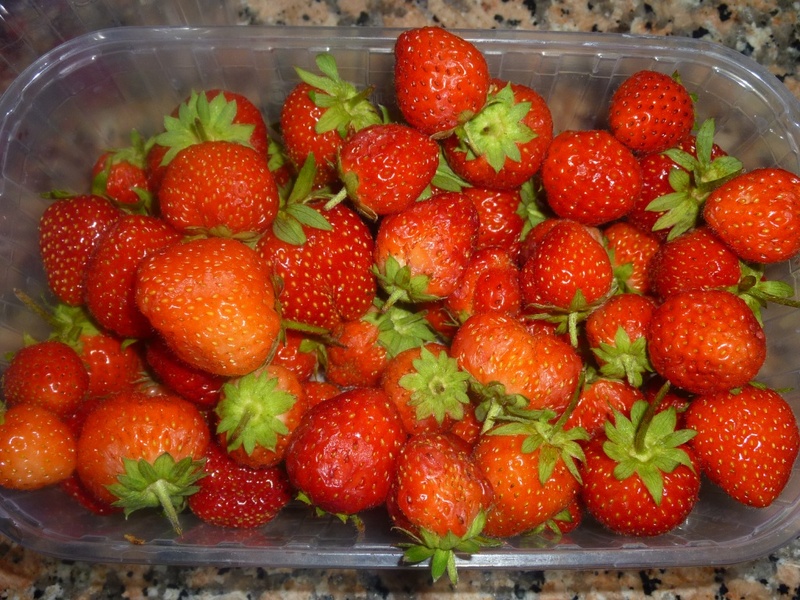 Here the season for strawberries to be in the shops is very short and ‘pick your own’ doesn’t exist, so in March I decided to buy some plants which promised fruit over an extended period. I didn’t really expect too much in their first year but I was pleasantly surprised. The initial crop which presumably should be the main crop was sparse, but as the summer continued there was hardly a day when there wasn’t a small bowl to enjoy, and for my birthday in September there was enough for a party of 25 (just a small serving each); runners have rooted all around and they have fruited too; certainly I need to do some organising but they have paid for themselves many times over in their first year. Figs were good, although I felt the birds had more than their share, but I had enough. I love figs so I’m thinking of growing other varieties to extend the picking season. This is greedy as they fruit twice a year! 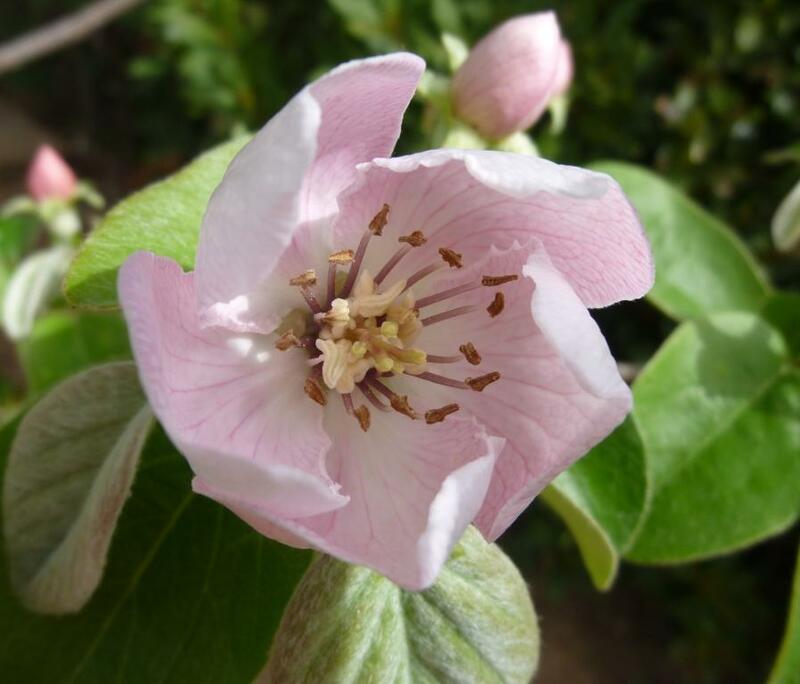 Due to the cold winter last year the crab apple flowered and fruited very well. 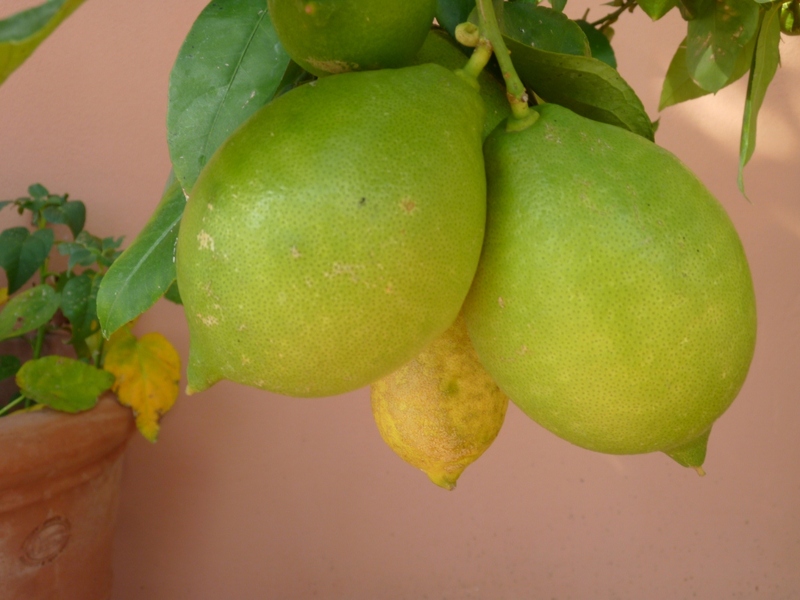 I enjoy seeing the bright fruits in the garden during the winter too much to harvest them for jelly. A second tree that has yellow fruits seems to drop them very quickly so if I have a crop next year I may harvest these to make crab apple jelly (not something my Italian friends have heard of. I’m a bit undecided about the melons I grew – I love growing them because I can (nearly impossible in the UK without lots of work); and most tasted good although I’m not sure that the shop bought ones weren’t sweeter, they took quite a lot of space and needed masses of water; those I grew in the greenhouse contracted a mouldy growth in their leaves quite early on although they continued to produce ripe fruit with hardly any leaves as I removed the diseased leaves so the mould wouldn’t spread to the tomatoes. 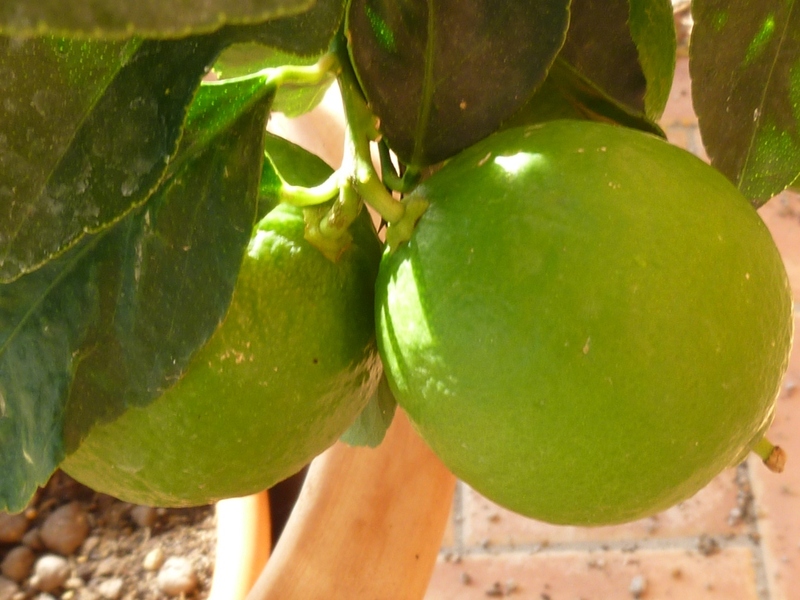 I probably will grow them again as then I don’t have to go to The lemons and limes I bought in spring have provided most of what I needed. 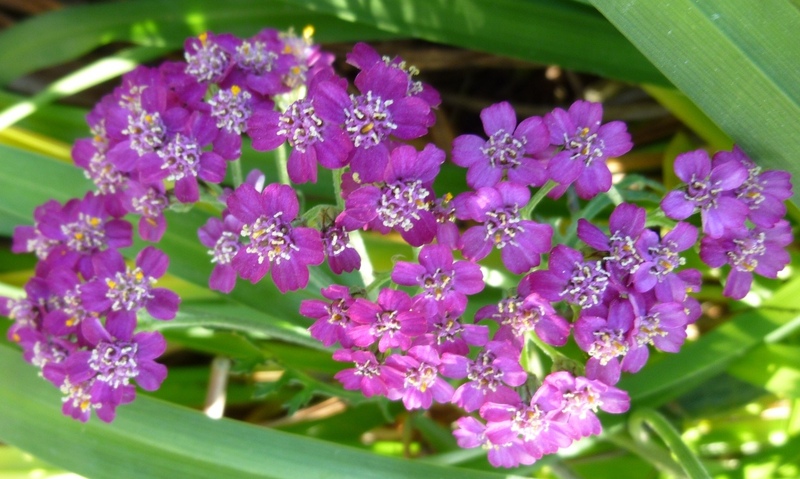 They don’t like the westerly hot wind during the summer and will be better when they can be in much larger pots. Now the weather has cooled and the wind dropped there are lots more fruit that I am hopeful will ripen during the winter in the greenhouse. the shops to buy them; I made gelato and granite with them as well as eating them for breakfast or with prosciutto as an anti pasto. I’d like to add a peach maybe grown as an espalier, a cherry or even 2 and a purple mulberry. We have a very large white mulberry but I find the fruit insipid so am happy to let the birds devour them. 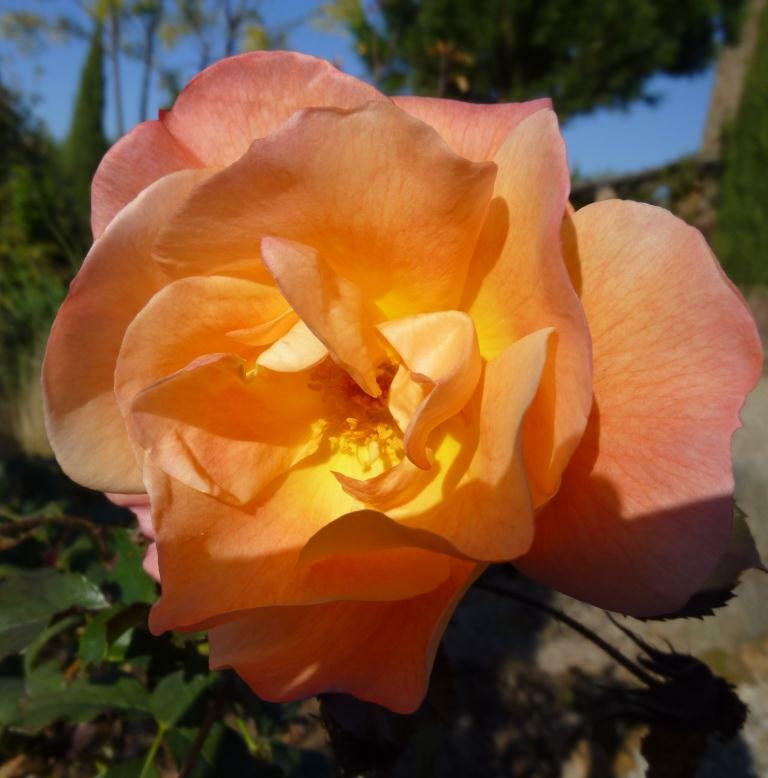 Sorry Helen for being so late; if you haven’t visited her yet visit the Patient Gardener for her end of month view and to read others bloggers accounts of what is happening in their gardens around the world.